This function allows you to check the status of the vehicle (reminder of the active alert warnings) and the service information. With the engine running, to start a manual check, briefly press the "CHECK/000" button on the instrument panel. 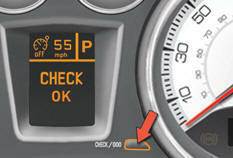 If no faults have been detected, "CHECK OK" appears in the instrument panel central screen. 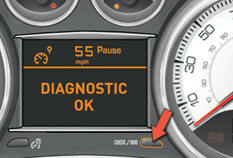 If a "major" fault has been detected, only the warning lamps concerned appear in the instrument panel central screen.